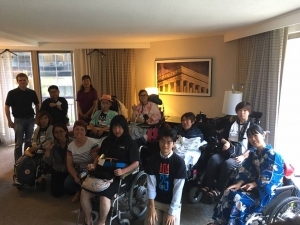 From July 22nd to 29th 2017, the Japan Council of Independent Living organized a tour to directly experience the disability movement in the U.S. and meet front runners who have been working for the rights of persons with disabilities from all over the world. 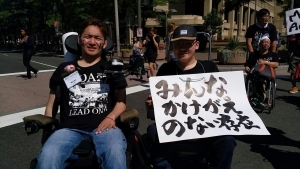 89 people, including 40 youth members (under 40 years-old), joined the tour, called “American with Disability Act tour (ADA tour)”from Japan. 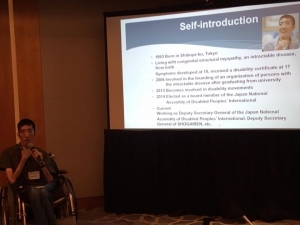 Besides our participation, leaders with disabilities from over 20 countries got together in Washington D.C., U.S.A.
Four staff members from DPI-Japan　(Satoshi Sato, Keiichiro Tamaru, Seiichiro Shirai, Daisuke Kasayanagi) joined a tour and attended the Global Independent Living Summit and the Annual Conference of the National Council on Independent Living(NICL)in Washington D.C. 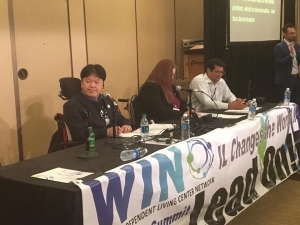 Leaders of Centers for Independent Living(CIL)from all over the world met up and established the World Independent Living Center Network (WIN) at the Summit. We were present at the moment that such a global network was set up. 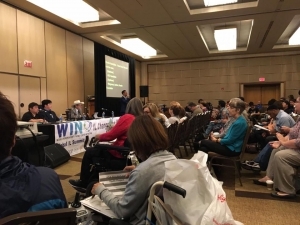 WIN is expected to develop the CIL network and spread Independent Living concept to the world. 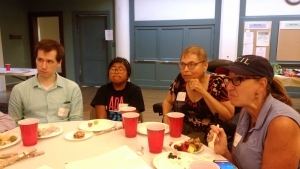 At the Annual Conference for NICL, we directly experienced the enthusiasm of the disability movements in the U.S. by attending the general meeting, which was full of a sense of danger about the retrenchment of the budget for persons with disabilities and the undesirable amendment to Medicaid. We joined rally, march, lobby the members of the Diet and stage a sit-in at the Diet members’ offices. 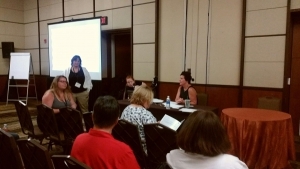 We also learned about the CIL’s wide range of activities in the U.S. at various sub-committee meetings at the conference. We had wonderful encounters and strengthened our ties with American youth, and deepened the bonds among Japanese members during our stay there. 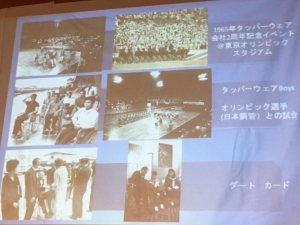 One of the aims of this tour for Japanese youth was to “Be faithful fellows”. We are sure that we achieved this. We thank all of you for your support, doing such things as making donations and buying T-shirts to help with our fundraising efforts. 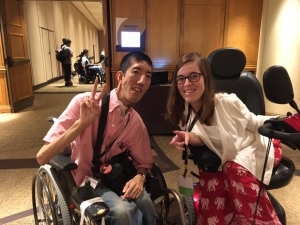 We will make use of the experience and our relationships with foreign fellows to move forward with our disability movement. 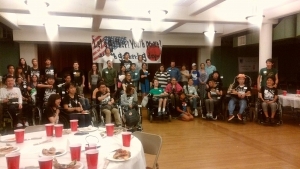 Japanese and American youth members held a social exchange party, “Youth Gathering Day!”. 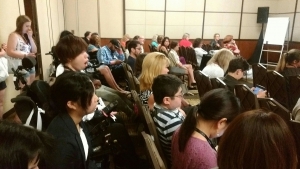 A total of 60 people from the U.S and Japan participated in the party. 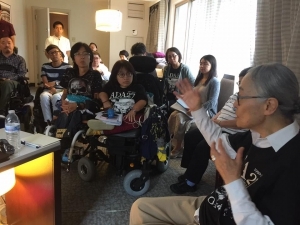 Ms,Judy Human as the Mather of ADA, Ms.Yoshiko Dart, wife of Mr. Justin Dart, who is known as the Father of ADA and Ms.Masako Okuhira from Japanese Society for Rehabilitation of Persons with Disabilities also came running to the party. 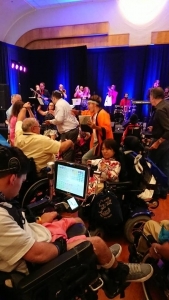 The Global Independent Living Summit was held by leaders from over 20 countries. 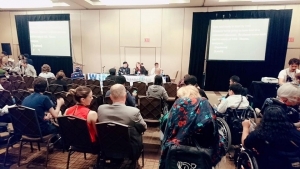 Over 200 people took part in the summit and reported about activities and capacity development of youths with disabilities in each country. In the afternoon, WIN, which aimed to make a gradual network among CILs in the world, was finally established. 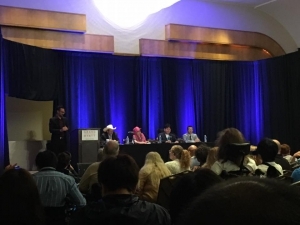 As today was the first day of the conference, a total of 700 people from all over the world participated in it. 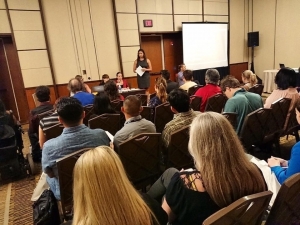 The conference held in the morning was full of tense atmospheres because of cutting in the budget related to persons with disabilities such as healthcare, accommodation and public transportation. 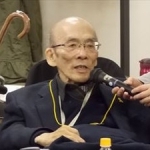 The first sub-committee was held in the afternoon. 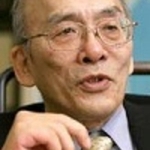 Such sub-committees will be held every day until Thursday. The Trump administration plans to make deep budget cuts to Medicaid and other forms of social security. Today was an important day, as if the repeal and replacement of the Affordable Care Act (Obama Care) started to be deliberated. 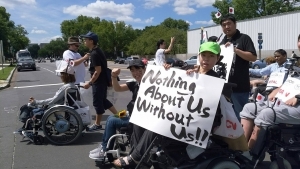 We Japanese participants of the ADA tour joined the parade which was against the repeal, and we all shouted out together, “Save Medicaid! No Cuts! No Cuts!”, as we walked unitedly toward the Capitol Building. 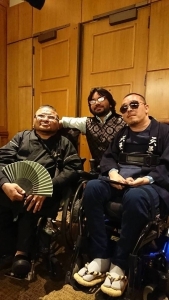 We can’t forget that one year has almost passed since the Sagamihara stabbing occurred, that 19 persons with severe disabilities in Sagamihara, in the prefecture of Kanagawa, were killed. We prayed silently for the victims rests and such rampage would never occur in the future. While rallying to the Capital Building, we showed cards on which were written “Never forget 19 lives” and put stickers of “Don’t forget the lives of 19” on our faces and arms. The long-continued parade continued for hundreds of meters. The youth members invited Ms. Amber to a meeting with the youth members. 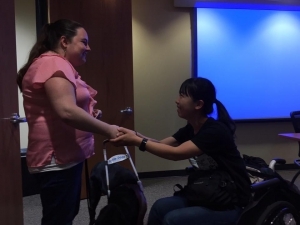 She is with hearing impairment from Access Living, which has the most powerful momentum of disability movement in the U.S., talked about her personal report, the reason why she brought her passion into IL, and provided a training called “Resist” through playing a game in the morning. A question-and-answer session with Ms. Judy Human was held in the afternoon. 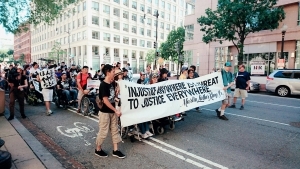 We realized　our agenda is not maintaining the current state of the disability movement . 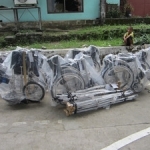 We should create a much stronger movement than before that will change more lives of people with disabilities. It’s important to give a hand to people who have not been reached yet. At night, an American-style party with singing and dancing was held! 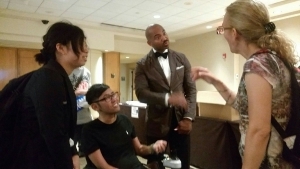 We, the next generation of the disability movement will enjoy it and make it stronger! 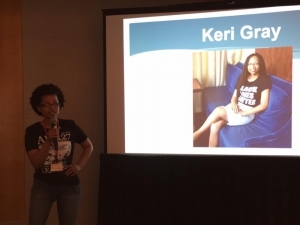 We participated in three subcommittees, “Empowering Youth to Succeeding at the Fifth Core!”, “Youth-Led Intersectional Organizing” and “There’s No Place Like Home”. At the closing ceremony, there was a unique lottery. Participants buy a lottery ticket for one dollar and a winner can take a half of the sales of the lottery. The other half of it is donated to NCIL. 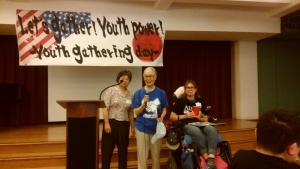 Japan-U.S. youth organized a U.S.-Japan Youth Summit themed, “Minority Report without Borders.” In the morning. 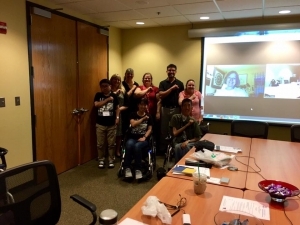 Mr.Shirai Seiichiro from DPI-Japan and Ms.Yumi Kimura from CIL Tekuteku in Japan and Ms.Kery Gray from US Business Leadership Network and Mr. Reid Caplan from Austic Self Advocacy Network in the U.S. reported about issues of each minority group there. I was glad that 15 American youth members participated in the summit, in contrast to the 9 participants that were initially supposed to be there, and I was able to talk to more American members. 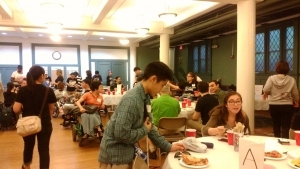 Beyond the borders and categories of disabilities, the waves of exchange are growing. There can be no substitute for this experience. I strongly want to increase the strength of this relationship. 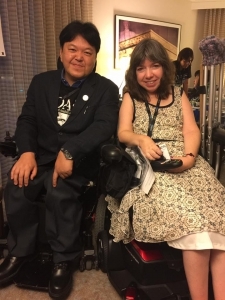 We, the next generation of the disability movement in Japan, will enjoy the disability movement and make it stronger than ever before! 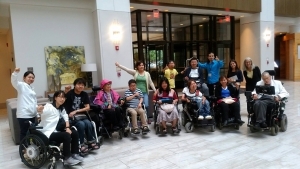 We went to the Mid-Atlantic ADA Center in Rockville, Washington in the afternoon. 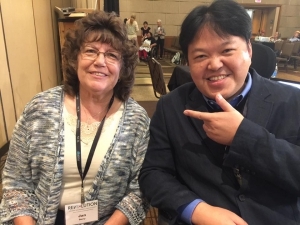 Ms.Yoshiko Dart is Japanese, and wife of Mr. Justin Dart, who is known as the Father of ADA. 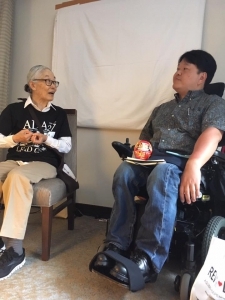 She has continuously supported disabled peoples’ organizations, especially youth programs, and donates to NCIL every year. 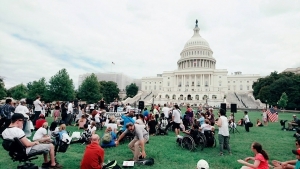 Many American leaders with disabilities give her respect and admiration. 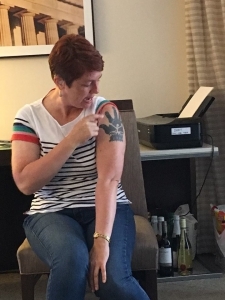 In this talk session, she discussed why Justin, her husband, became involved in the disability movement, enacted ADA and his beliefs while recalling his life. 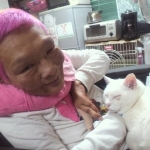 Her story was full of sympathy and generosity toward others.